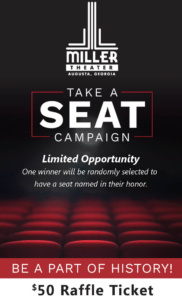 Help support the Miller Theater and enter our Take A Seat Raffle for a chance to have a seat in the theater named in your honor! Raffle tickets are available at $50 each for a limited time only, and one winner will be randomly selected as the chair naming recipient. Click on the link to purchase your ticket and support the Miller Theater Project! For more information or any questions, contact Jillian Stewart at (706) 826-4705 or jillian@soaugusta.org.